Board Swarn Shatabdi Express At 07:20 Hrs From New Delhi Railway Station, Ea And Breakfast On Board, Train Arrive Amritsar Railway Station At 1325 Hrs. On Arrival Meet And Greet By Our Representative Who Will Take You To The Hotel. Check In Hotel. Evening Visit Indo-Pak Wagah Border To Watch Flag Retreat Ceremony- Wagah, An Army Outpost On Indo-Pak Border 30 Kms From Amritsar Where The Daily Highlight Is The Evening "Beating The Retreat" Ceremony. Soldiers From Both Countries March In Perfect Drill, Going Through The Steps Of Bringing Down Their Respective National Flags. As The Sun Goes Down, Nationalistic Fervour Rises And Lights Are Switched On Marking The End Of The Day Amidst Thunderous Applause. Return To Hotel. Overnight Stay. Then Visit Jallianwala Bagh- Where, On April 13, 1919, British And Gurkha Soldiers Opened Fire On An Unarmed Forbidden Gathering, Killing Hundreds Of Civilians. Then Visit Durgiana Temple, The Temple Of Godess Of Power. 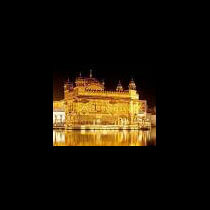 You Can Also Do Shopping In Old Amritsar Market For Ladies Suites And Punjab Jutti (Traditional Punjab Shoes). After Lunch Visit Maharaja Ranjit Singh Summer Palace Museum- The Summer Place Of Maharaja Ranjit Singh Which Is Situated In The Heart Of Ram Bagh, Amritsar, Later Drop At Amritsar Railway Station To Board Shatabdi Express To Delhi At 17:00 Hrs Reach Delhi At 22:50 Hrs. End Of Tour.